representation of an animal paradise ever constructed." was a internationally known German animal dealer and trainer. training as opposed to fear, showcasing their intelligence over ferocity. He was the founder of open-air zoos. cages of monkeys and exotic birds, elephants, etc. 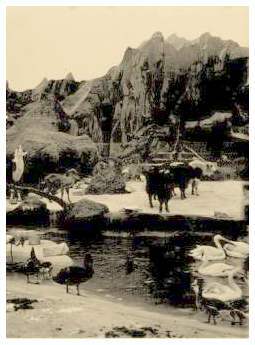 Despite his kindness and love of animals, Hagenbeck had a fondness for the outrageous and bizarre. 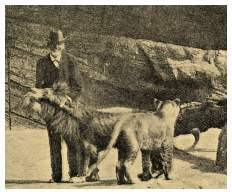 He bred and displayed one-of-a-kind animals such as the liger (cross between a lion and a tiger), and a zebra-horse. Though sterile, these animals were healthy and a popular curiosity. forward, the elephant slides down, throwing a huge blast of of water out-spraying the limits of the pool and cooling the crowd of spectators. Supposedly, the elephants enjoyed the slide and water bath. Getting them out of the water was a tough job for the handlers. 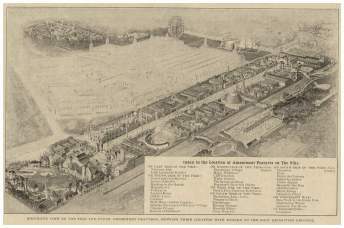 The baby elephants which plunged down the slide were brought over from Hindostan by Lorenz Hagenbeck, the youngest son of Carl Hagenbeck. Shooting-the-chutes was done in India by assembling elephants on the sloping mud banks of rivers. show. And additional 10 cents for animal rides (tortoise, elephant, zebra, donkey, ostrich, camel or a llama). An ornate season pass from Carl Hagenbeck Zoological Paradise and Trained Animal Show. Outside Hagenbeck's attraction on the Pike.